So this hat has a bit of history for me, and I'm sure a couple of you might laugh at it. I know I do now, though in the past, my issues with it have caused an occasional eye twitch. I'm just really, horrifically bad with lace patterns, it seems. Well, I'm not bad - if - I put stitch markers between every pattern repeat and religiously count off numbers. Why yes, Nick does give me strange looks whenever I sit on our couch going "One... two... SKP2... one... two..."
Anyway, I actually started this hat last year. A friend of mine wanted me to make a hat for his girlfriend has a Christmas (2008) gift. 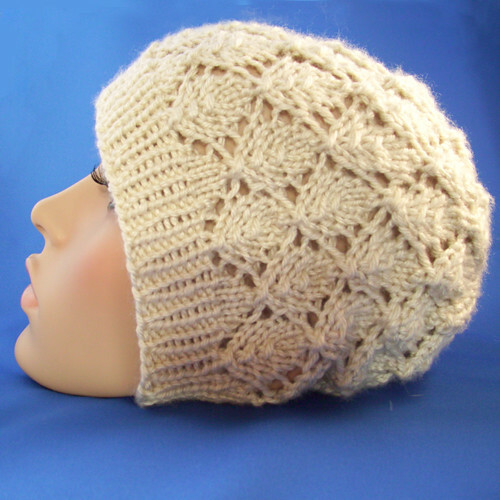 I had found this pattern and knew that pretty much everyone and their cousins had knitted this hat, and most of the reviews made it sound so easy. My knitting skills were getting much better, and I thought it would be a great intermediate project for me. Well, it wasn't. I couldn't count. Somehow, after switching from my DPN's to my circulars (this hat is knit top-down) and would begin the next row, the YO's would be off, and my leaves would start migrating to the right, and I'd just get so fed up I'd throw my yarn in a pile and not look at it again for days. Rinse, repeat, and you pretty much have my whole late-October of 2008. This year, I decided to try my hand at this one again. I had tons of cream-colored yarn left over from a commission, so I thought this might be a fun way to use it up (and for the record, I got like three hats out of one skein with my knitting - sometimes, it's just so much more cost-efficient than crochet!). I only had to frog it once, which made me very proud! Eventually, I figured out that after switching to circulars, I should place a marker every 8 stitches, and that really helped me keep on track with the pattern, and see where I was messing up (for example, if I forgot to PSSO during the SK2P's or something like that, which was often the problem), or if I had forgotten to YO the row before. Lo and behold, the pattern is actually easy, and I no longer refer to it as the devil's hat. And the result is actually quite pretty! A little big, I think, so next time I might use smaller needles, and I didn't switch to smaller needles for the ribbing as the directions said, so that's totally my fault. But it still looks nice, and super comfortable!